Banners are printed on 13 oz. vinyl material, which can be used in indoor or outdoor settings. Sizes available: 2.5x4, 3x6, 3x9 and 4x8. Orientation: Banners are available in the horizontal and vertical orientation. Printing: Full-color printing on the front. 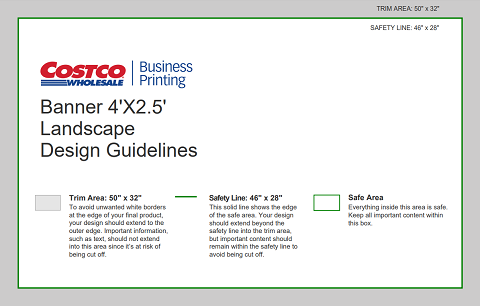 Single-sided printing only. 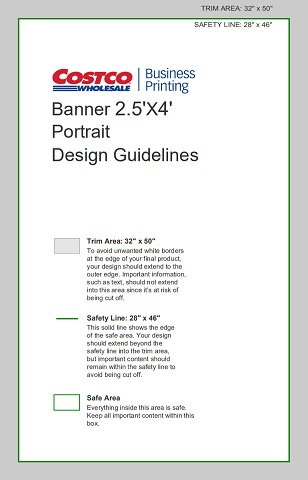 Finishing: Banners are finished with a heat welded edge, with the option to add black hanging grommets. See templates for grommet placement.